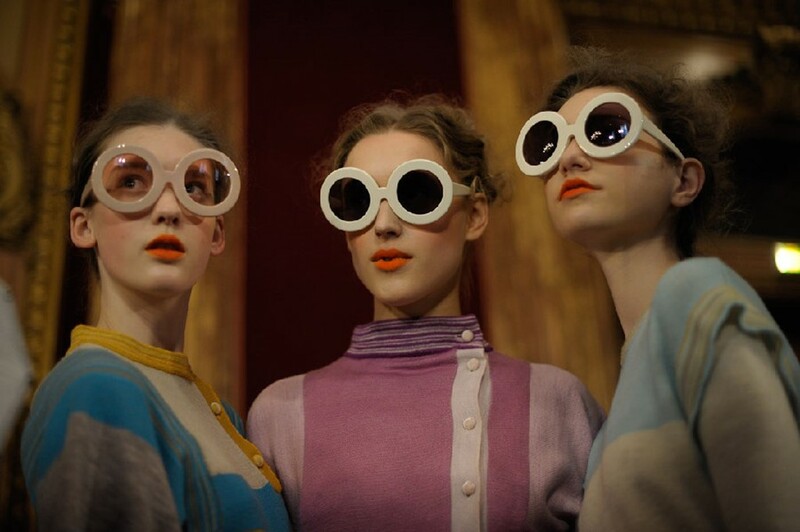 We’re never going to get a Tsumori Chisato show that is full restrained but it may have started off that way with pastel colour blocked knits in 60s shift shapes with abstract applique on camel that recalled 70s arts and craft items. Actually you couldn’t really place one particular decade upon Chisato’s collection which as per usual mixed it up to a saccharine degree, throwing in everything she consistently loves and ensuring that you leave cooing over the cuteness of it all. Modish stripes with Fair Isle ones, digital geometric prints with hand-drawn illustrations, 1920s opera capes, cocktail pyjamas and harlequin costumes as well as the decade filtered through 70s silhouettes – it was all going on and what keeps it together is Chisato’s dedication to her cause of the eclectic mix. That said, there were in parts more serious elements such as the coats that nodded along to this season’s penchant for furry gorilla-esque arms and fake fur along with chunky knits, feathers on Chisato’s version of a flapper dress and velvet devore all made for a riot of texture in the collection. Dazed Digital: What are the inspiration points behind the illustrations this season? Tsumori Chisato: The trompe l’oeil and surreal based illustrations were what I was going for – you might see a hand or a bag floating about. There’s something mysterious about the illustrations and it’s difficult to define. DD: What were the shapes focused on? DD: Was there an overarching theme? Tsumori Chisato: It’s a mixture of everything I like . It’s a mixture of different styles. You can find a lot of silhouettes here – something very tight, fluid or loose. It’s a mix of materials and texture which is important for this collection– fake furs, wool and silk knits – all mixed together.